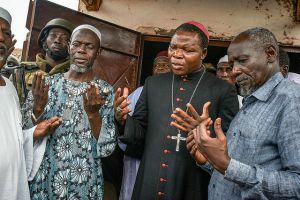 Christian and Muslim religious leaders from the Central African Republic received an international award for their role in preventing sectarian war in their country. Archbishop Dieudonné Nzapalainga of Bangui, Imam Oumar Kobine Layama and Pastor Nicolas Guérékoyaméné-Gbangou received the prize as founders of the Interfaith Peace Platform. The award is given every two years in honour of Sergio Vieira de Mello, the United Nations envoy who was killed when a suicide bomber attacked the UN offices in Baghdad 12 years ago. Vieira de Mello’s widow and his two sons handed out the prizes in a ceremony at the UN in Geneva on Wednesday 19 August, to coincide with World Humanitarian Day – a special day to mark fallen aid workers. “The Interfaith Peace Platform shows what it takes during a crisis to bring a country together across the social, cultural and religious divides,” said one of the sons, Laurent Vieira de Mello, who heads the Sergio Vieira de Mello Foundation. 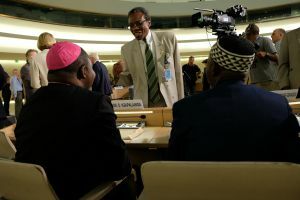 The Interfaith Peace Platform worked to stop armed groups from exploiting religion to create chaos in the Central African Republic. Violence engulfed the country from late 2012, leaving thousands dead and hundreds of thousands forced from their homes. The fighting pitted ‘Seleka’ rebels against ‘anti-balaka’ militias. “It was not a religious conflict,” said Imam Oumar Kobine Layama, President of the Islamic Council in CAR, who paid tribute to all humanitarians especially those who had sacrificed their lives. The platform travelled to trouble spots to preach messages of peace and religious understanding to communities. They also travelled internationally to call for an increase in peacekeeping efforts. They were support by Caritas and other Faith Based Organisations. They have been credited with stopping a spiral into even greater chaos and bloodshed. “God expressed himself through the peace platform to stop the virus of division and hate,” said the archbishop. “Our efforts will continue until hearts of people in Central Africa are disarmed. Thank you to all of those who have acknowledged us as it encourages us to do even more,” said President of the Evangelical Alliance, Pastor Nicolas Guérékoyaméné-Gbangou.